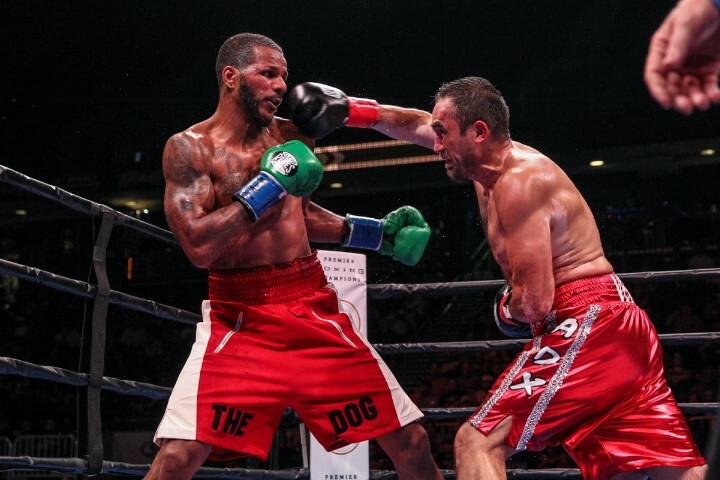 (Photo credit: Lucas Noonan/Premier Boxing Champions) 30-year-old former WBC 168lb champion Anthony Dirrell (28-1-1, 22 KOs) defeated Marco Antonio Rubio (59-8-1, 51 KOs) by a 10 round decision in a mismatch on Premier Boxing Champions on CBS from the American Bank Center in Corpus Christi, Texas. Rubio was little more than a punching bag in the fight for the much bigger, stronger and quicker Dirrell. The three judges all scored the fight the same in giving Dirrell every round by the scores of 100-90, 100-90 and 100-90. Dirrell had Rubio slightly hurt on a number of occasions, but he wasn’t able to finish him off due to him throwing only shot at a time. Dirrell’s pot shot style of fighting wasn’t conducive to getting a knockout against a guy with a good chin like Rubio. We didn’t see much improvement in Dirrell from his last fight against Badou Jack. Dirrell still doesn’t seem capable of throwing combinations, and he still waits too long before throwing his shots. Rubio was there to be hit all night long, but Dirrell spent a lot of time just standing and waiting for Rubio to throw his punches first. Dirrell needs to show that he can be first when he’s on offense, and he doesn’t appear to be capable of doing this in any real way. A good super middleweight would have given Dirrell a lot of problems. If he were facing Badou Jack today instead of Rubio, then he would have lost again. Jack’s pressure style and combination punching would have been too much for Dirrell. WBA World bantamweight champion Jamie McDonnell (27-2-1, 12 Kos) retained his WBA title today with a 12 round unanimous decision win over Tomoki “El Mexicanito” Kameda (31-2, 19 KOs) in the co-feature bout. Many of the rounds were difficult to score, and you can make an argument that the fight should have been scored a draw. The referee blew a call in the 12th round when he gave McDonnell a credit for a knockdown on a slip by Kameda. As it turns out, it wasn’t a big deal because the judges gave McDonell a win by a wide enough set of scores to show that the fight would have still gone to McDonnell even if the referee hadn’t blown the call. The final scores were 116-111, 115-112, and 117-110. Two of the judges clearly did Kameda no favors in scoring the fight by the one-sided scores that they did, because the fight was clearly closer than those two scores. At best, you could give McDonnell a narrow one or two point win, but definitely not a 117-110 or 116-111 win. That was just ridiculous.